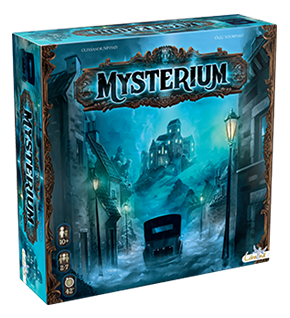 Beautifully designed and illustrated, Mysterium is an atmospheric asymmetrical co-op game that involves a single ghost player and a team of psychics. Armed only with a deck of cards depicting mysterious and vague images (‘visions’), the ghost tries to communicate to the other players the facts of its murder: who was responsible, where it happened, and with what object. Not only isMysterium fun and challenging, but it’s a fascinating insight into how people subconsciously develop an understanding of how other people communicate. The ghost and players will certainly find things easier if they know each other well, and can hazard an educated guess on whether, for example, a certain player will jump to associations between colour, or shape, or subject matter. But it can also be very frustrating for the ghost when a player runs off on a strange tangent and completely misses the direction you are trying to point them in with your limited selection of images! Medium should be three crows per game not turn. Whoops! Thanks for that, fixed.